Eurocars the sole agent of Porsche in Sri Lanka welcomes new and exclusive mid-engine Porsche models; the 718 Boxster and 718 Boxster S. The two-seat convertibles are now more powerful yet more fuel efficient. The centerpiece of the new model series is the newly developed four-cylinder flat engine with turbocharging. The 718 Boxster develops 220 kW (300 hp) of power from two litres of engine displacement, while the 718 Boxster S produces 257 kW (350 hp) from 2.5 litres of displacement. In the S-model, Porsche also uses a turbocharger with variable turbine geometry. In fact Porsche is now the only manufacturer to offer VTG technology in production cars with petrol-driven engines, both in the 911 Turbo and in the 718 Boxster S. Impressive here are the considerable power gain of 26 kW (35 hp) compared to the previous Boxster models and the efficiency of the new turbo engines. The new 718 Boxster models also have fuel economy improvements of up to 13 per cent. While the completely new chassis tuning and stronger brakes provide for passionate and sporty driving pleasure, inside a newly designed dash panel frames the cockpit. In addition, the latest generation of Porsche Communication Management (PCM), Porsche’s control center for audio, communication and navigation functions on a state-of-the-art touchscreen comes as standard. The 718 model line can be recognized at first glance; the front end of the new roadster exhibits a much more sculptural form with a wider and more masculine appearance. The much larger cooling air intakes at the front provide a distinct exterior expression of the new turbo engine concept while the new design of the bi-xenon headlights debuts with integrated LED daytime running lights. LED headlights with four-point daytime running lights are also available as a new option. The launch of the new 718 Boxster generation represents the first time since the late 1960’s that Porsche is again implementing sports cars with four-cylinder flat engines. Turbocharging significantly boosts torque. The two-litre engine of the 718 Boxster has a maximum torque of 380 Newton metres 100 Newton metres more, which is available from 1,950 rpm to 4,500 rpm. 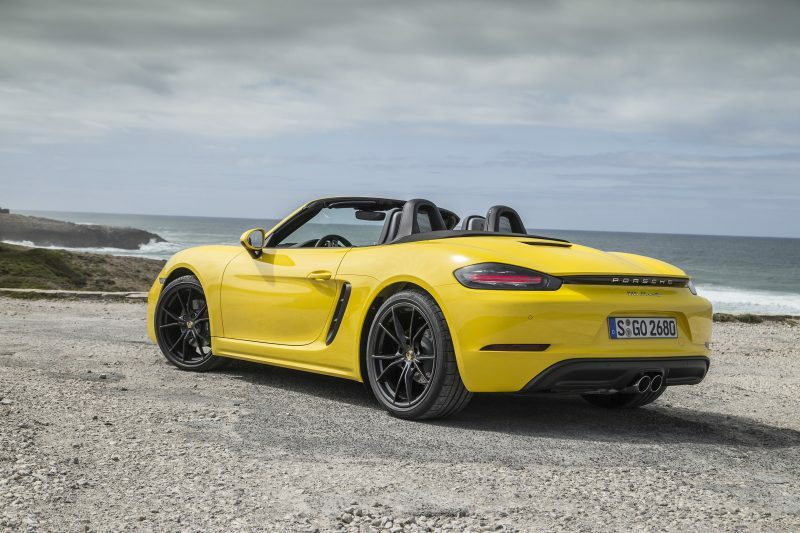 The 2.5-litre engine of the 718 Boxster S even attains 420 Newton metres (60 Newton metres more) over a speed range from 1,900 rpm to 4,500 rpm. The Porsche turbo concept is boosting driving performance while improving fuel economy. In the 718 Boxster, the four-cylinder flat engine with PDK has a NEDC fuel consumption figure of 6.9 l/100 km (1.0 l/100 km less). In the 718 Boxster S, the 2.5 litre turbo flat engine with PDK consumes just 7.3 l/100 km (0.9 l/100 km less). The 718 models come with a six-speed manual transmission as standard. The Porsche Dop-pelkupplungsgetriebe (PDK), which now features fuel-saving virtual gears, is available as an option. In its driving dynamics, the new roadster follows in the tracks of the original 718. The car’s completely re-tuned chassis enhances cornering performance. The electromechanical steering system is configured to be ten per cent more direct. This makes the 718 Boxster even more agile and easier to steer, both on circuit tracks and in everyday traffic. Available at extra charge for the roadsters is Porsche Active Suspension Management (PASM) with a ten millimeter lower ride height. For the first time, the PASM sport chassis with a 20 millimeter lower ride height is available as an option for the 718 Boxster S. The active chassis, which has also been re-tuned, offers an even broader spread between long-distance touring comfort and dynamic sporty stiffness. Awaiting the driver in the cockpit of the 718 Boxster is the familiar Porsche interior environment, now upgraded with new elements such as the instrument panel. Another central element of the new interior layout is the Porsche Communication Management (PCM) unit with mobile phone preparation, audio interfaces and the Sound Package Plus with 110 watts of audio power.